Tiger Woods admitted his expectations were "unknown" as he returned to action following spinal fusion surgery, but his first full season since 2014 turned out to be one of his most memorable. When Woods made his latest, tentative return from back surgery at his Hero World Challenge in December 2017, he was ranked 1,199th in the world. Fast forward 12 months, and he was back knocking on the door of the top 10 after completing a successful comeback season which rejuvenated interest in golf. Woods' "journey into the unknown" began with his return to full-field PGA Tour action at the Farmers Insurance Open in January, in which he ended up in an encouraging tie for 23rd place, seven behind winner Jason Day, following four consistent rounds of 72, 71, 70 and 72. His competitive desire was evident as he made it into the weekend thanks to a final-hole birdie in the second round, and he briefly got to within five of the lead at one stage during the final round with his short game in fine fettle, but the most significant result for Woods was that he came through four rounds with no adverse effects in his fused back. Woods was back in action in mid-February at the Genesis Open in Los Angeles but he failed to build on the promise he had shown at Torrey Pines as he missed the cut by four shots following rounds of 72 and 76 as he struggled for form in all areas of his game. But, with his fitness improving, Woods was out again the following week at the Honda Classic in Florida and there was plenty of encouragement for him as he hovered just out of contention and finished in 12th place, eight shots behind play-off winner Justin Thomas. After missing out on the WGC-Mexico Championship, the Valspar Championship at Palm Harbor was next for Woods and he went so close to snatching his first comeback success. He started the final round only one off the lead, and that's also where he finished as he was denied by a brilliant 65 from Paul Casey on Sunday. Woods then headed straight to Bay Hill for the Arnold Palmer Invitational, a tournament he had won on eight occasions previously, and it brought another highly-creditable performance as he came joint-fifth, eight shots behind champion Rory McIlroy having been only one behind until one bad swish of a driver on the back nine resulted in his ball hooking out of bounds. Those last two performances meant he had risen to 105th in the world rankings ahead of The Masters, but there was to be no 15th major title at Augusta National as he finished tied for 32nd, 16 shots behind Patrick Reed. Woods took the best part of a month off before returning at the Wells Fargo Championship, where he once again flirted with the cut as he struggled on the greens, and he was unable to improve over the weekend and ended up on two over and outside the top 50. The 42-year-old again made the cut with nothing to spare at The Players Championship a week later, but he then lit up TPC Sawgrass on the Saturday with his best round since returning to action as a 65 saw him storm through the field. Webb Simpson, however, was dominating the tournament and he eased to victory on the Sunday with Woods finishing seven shots behind in a tie for 11th after closing with a 69. Woods was chasing a sixth win at The Memorial at the end of May but a torrid start as he slumped to four over after seven holes left him with too much work to do. He recovered to sign for a 72 in the first round and followed that up with scores of 67, 68 and 72 to finish tied for 23rd on nine under, six behind play-off victor Bryson DeChambeau. The US Open at Shinnecock Hills in mid-June provided one of the year's low points for Woods as he missed the cut for only the third time in the tournament. A first-round 78 left him languishing in the bottom half of the field and, despite improving on the Friday with a 72, he was still two off the mark on 10 over at the halfway stage. But he bounced back from that disappointment a couple of weeks later with another good performance at the Quicken Loans National, his second 65 of the year in the second round putting him four off the lead as he began to find his putting rhythm. Scores of 68 and 66 followed but Francesco Molinari was storming to victory out in front, leaving Woods to settle for joint-fourth 10 shots adrift of the runaway Italian. After a two-week break, Woods headed across the Atlantic to Carnoustie to play in The Open for the first time since 2015. After back-to-back rounds of 71, he was six off the lead at the halfway stage but a five-under 66 - his best round in the major for 12 years - took him to within four of the lead. Expectations of a fairytale win were heightened when Woods suddenly held the outright lead midway through the final round with the leaders faltering, but a double-bogey at the 11th and a bogey at the 12th took him out of the running and he eventually finished in a tie for sixth on five under, three behind Molinari as the Italian claimed his maiden major win. One consolation for Woods was that he had broken back into the world's top 50 and qualified for the WGC-Bridgestone Invitational, an event he had won eight times in the past. After kicking off with scores of 66 and 68 at Firestone, a pair of error-strewn 73s over the weekend left him on level par and in a tie for 31st, 15 shots off the pace. Woods vowed to "clean up" his putting after that display with the PGA Championship just a week later and his homework almost paid dividends at Bellerive Country Club. After a bogey, double-bogey start, he dug deep to salvage a 70 and then posted back-to-back 66s to haul himself into contention. Roared on by huge crowds, he then fired a superb six-under 64 in the final round - the lowest final-day major score of his career - but it was not enough to secure him that elusive victory as Brooks Koepka held firm in front to triumph by two shots and win consecutive major titles. Woods got off to a disappointing start to the FedExCup Play-Offs as he stumbled to a tie for 40th at The Northern Trust, and he was upstaged by DeChambeau again at the following week's Dell Technologies Championship, where Woods was nine behind the winner in a share of 24th. But he continued trending in the right direction at the BMW Championship where Woods and McIlroy lit up the opening day with eight-under 62s as the star duo shared the early lead. However, he could not build on his lowest opening round on the PGA Tour since 1999 and slipped back into the pack with a second-round 70. Although he recovered with a 66 and 65 over the weekend to claim a share of sixth place on 17 under, three behind play-off victor Keegan Bradley, and Woods felt his momentum was building nicely as he headed to the final tournament of the season - the Tour Championship in Atlanta. 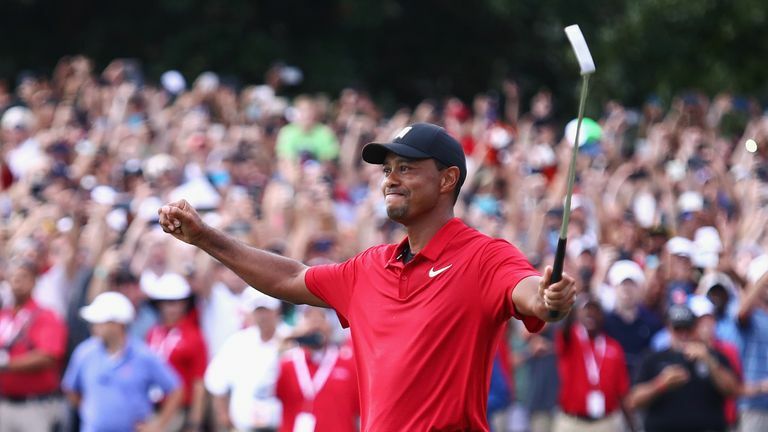 Watch the emotional scenes and wild crowd as Tiger Woods wins his first title in five years with victory at the Tour Championship. Woods shared the halfway lead after opening rounds of 65 and 68, and another high-quality 65 took him three clear of Justin Rose and McIlroy with 18 holes remaining. East Lake then witnessed incredible scenes on Sunday as Woods secured his first title in five years by two shots, finally ending his five-year winning drought with thousands scrambling for a good vantage point at the 72nd hole. Unfortunately for Woods, and Team USA, the physical and mental strain in Atlanta took its toll in the Ryder Cup a week later, and he became the first player to lose all four of his matches since Steve Stricker in 2012, and only the fourth since 1979, as Europe stormed to a convincing seven-point victory. 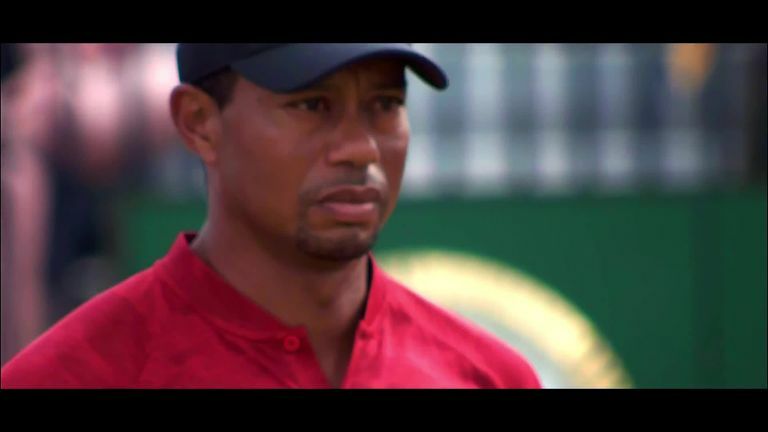 Woods then put his clubs away before dusting them off for The Match, where he and Phil Mickelson faced off in a controversial $9m showdown, and he was battling illness the following week as he finished above only Hideki Matsuyama back at Albany in the Bahamas. But he declared his comeback season a resounding success, and he will look forward to 2019 with renewed optimism of more titles, and that elusive 15th major championship.